Pelican's Drinking Water Purifier is a water purification treatment system. It is made in the USA and meets the EPA's Guide Standard for microbiological purifiers. This state-of-the-art filtration system uses a triple filter design to reduce unwanted elements in your drinking water. The system will discontinue water flow when its capacity to filter unwanted elements is exhausted, which will safeguard your family against contaminated water. 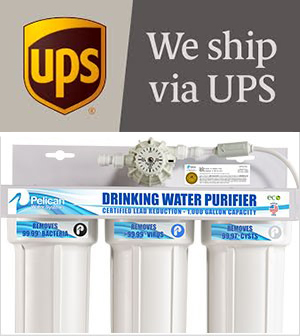 The filters last six months or 1,000 gallons and are quick and easy to replace. One of the common concerns people have about their household water is whether it’s contaminated by potentially harmful bacteria and other microorganisms. Since bacteria in water cannot be seen, tasted, or smelled (and many health-related symptoms are not immediately noticeable), the only way to identify if bacteria are present in your water is to get it tested. Outside of testing, using a drinking water purification system is the best way to ensure your water is cleaner and healthier, providing peace of mind every time you or a loved one has a glass of water. Pelican's Drinking Water Purifier is a state-of-the-art drinking water purifier that meets the EPA's Guide Standard for microbiological purifiers and will reduce chlorine, lead, virus, bacteria, cysts, particulates and numerous organic compounds from your water. The purification system reduces these unwanted elements from your drinking water using a triple filter design. It will discontinue water flow when its capacity to filter unwanted elements is exhausted, which will safeguard your family against contaminated water. The filter lasts for six months, or 1,000 gallons, and is quick and easy to replace. The US has one of the best water treatment systems in the world-waterborne threats such as cholera and typhoid are almost unheard of in North America. That doesn't mean, however, that our water can't be contaminated by microorganisms. And with our water treatment infrastructure aging rapidly, it's highly possible we're going to see an increase in boil water advisories in the future. Unlike UV or other methods of treating your water with chemicals, the Pelican Drinking Water Purifier physically filters out the bacteria and virsues from your water using a patented and certified filtration technology that incorporates the best methods of mechanical filtration. Our system has been rigeriously tested and certified to ensure your protection against viruses, bacteria and lead and comes with a built in meter to prevent untreated water from ever getting into your drinking water when your filters life is exhausted. Pelican Water ("Pelican") warrants to the end user ("customer") that the PDF-1000VF drinking filter system(s) will be free from defects in material and workmanship under normal use and service for a period of 1 year from date of delivery. No warranty is made with respect to defects or damaged due to neglect, misuse, alterations, accident, misapplication, physical damage, installation on water quality outside guidelines for system or damaged caused by fire, acts of God, or freezing. Q. Can this be used with the Pelican Combo Series? Yes, the drinking water purifier is a great addition to the Pelican Combo Series. The combo series will address chlorine and chloramine taste and odor, sediment and scale. This drinking system adds the benefit of bacteria and virus removal, lead reduction and cyst removal. Combined with the combo series, this provides you the best overall filtration for your home. Yes this can be connected to a fridge or ice maker. You will have to purchase a seperate 3-way Tee to connect a seperate line to the fridge or ice maker. Q. Will this system change the TDS? While this system may reduce the TDS slightly as it filters out particulate, and cysts, the overall TDS will not be changed much. If TDS reduction is your primary concern we recommend looking at a Reverse Osmosis system for TDS reduction. Q. How Does The Meter Work? The meter is designed to ensure you never get untreated water into your drinking water. For 1,000 gallons the meter will measure your usage and when you hit the 1,000 gallon mark it will stop all water flow through the system preventing contaminated water from getting through. At that time you will change your filters and reset your meter which will monitor your water for another 1,000 gallons. The Pelican premium drinking system comes with a built in flow meter that will remind you when to change your filters. For peak performance we recommend you change your filters no later than 6 months after installation or after 1000 gallons of usage, which ever comes first. Never worry about when to change your filters again by signing up for our Water Shield Auto Ship program. No. The Pelican premium drinking system requires no electricity to filter your water and does not waste any water. It simply uses the incoming water pressure from your water supply to filter your water through a unique filter design that doesn't require electricity.